ab5201 specifically reacts with p400. p400 is immunoprecipiated with Tip60-TAP and there is no reactivity with Mock or unrelated TAP-tagged proteins (see the Western blot image). Synthetic peptide derived from residues 200 - 300 of Human p400. This antibody gave a positive signal in the following whole cell lysates: Tip60-TAP Transfected HeLa. This antibody gave a positive signal in the following cell lines: HeLa. Our Abpromise guarantee covers the use of ab5201 in the following tested applications. WB 1/1000. Predicted molecular weight: 344 kDa. Component of the NuA4 histone acetyltransferase complex which is involved in transcriptional activation of select genes principally by acetylation of nucleosomal histones H4 and H2A. This modification may both alter nucleosome - DNA interactions and promote interaction of the modified histones with other proteins which positively regulate transcription. May be required for transcriptional activation of E2F1 and MYC target genes during cellular proliferation. The NuA4 complex ATPase and helicase activities seem to be, at least in part, contributed by the association of RUVBL1 and RUVBL2 with EP400. May regulate ZNF42 transcription activity. Belongs to the SNF2/RAD54 helicase family. SWR1 subfamily. ICC/IF image of ab5201 stained human HeLa cells. 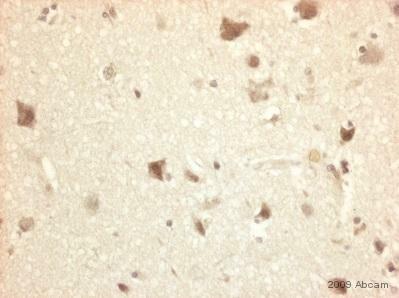 The cells were PFA fixed (3.7% PFA, 10 min) and incubated with the antibody (ab5201, 1µg/ml) for 1h at room temperature. The secondary antibody (green) was Alexa Fluor® 488 goat anti-rabbit IgG (H+L) used at a 1/1000 dilution for 1h. Image-iTTM FX Signal Enhancer was used as the primary blocking agent, 5% BSA (in TBS-T) was used for all other blocking steps. DAPI was used to stain the cell nuclei (blue). Alexa Fluor® 594 WGA was used to label plasma membranes (red). Rabbit polyclonal to p400 used at 1/1000. p400 is part of the Tip60/NuA4 HAT complex. Nuclear extracts from Mock (1), Tip60 (2) and an unrelated TAP-tagged protein (3) were purified by tandem affinity purification. No non-specific bands are observed. Whilst it is our normal policy to display the full gel for Western Blots, in this case we received a strip image from an academic collaborator. However, we still feel this image provides useful information on ab5201. Publishing research using ab5201? Please let us know so that we can cite the reference in this datasheet. Thank you for contacting us. The immunogen can be purchased from Abcam, it is catalog ab13753. I am interested in using this antibody to western blot for mouse p400. As stated on your site, cross reactivity w/mouse is likely, due to 87% identity with the immunogenic peptide. I was just wondering, in your experience, how often will the antibodies indeed cross react with a different species, given this degree of conservation? A ballpark guess would be fine. I would like to purchase the antibody, but it would be a shame if it did not work at all for me. Thank you for your enquiry. It is difficult to predict the cross reactivity of this antibody given an 87% identity. The reactivity will largely depend on the sites of identity and the epitopes recognized by the polyclonal antisera. On this occasion (please see the link below) there is a run of 6 amino acids at the N terminal region with 100% sequence identity in addition to two runs of four amino acids that share 100% sequence identity. I therefore consider it very likely that this antibody will react against the mouse homolog. However, ultimately whether the antibody reacts will depend on the epitopes recognized by the antibody and the degree of antigenicity of the immunizing peptide in these regions. http://www.ebi.ac.uk/cgi-bin/jobresults/clustalw/clustalw-20060518-09135931.aln? I hope this information helps, please do not hesitate to contact us if you need any more advice or information.